Why do I need Straight teeth? What are some signs of a bite problem? Overlapped, misplaced or blocked-out teeth, Protruding teeth, Biting the cheek or into the roof of the mouth, Teeth that meet in an abnormal manner or do not meet at all, Jaws that shift or make sounds, Jaws that protrude, retrude or contribute to facial imbalance and Cleft lip and palate. Most people have some discomfort after their braces are first put on or when adjusted during treatment. After the braces are on, teeth may become sore and may be tender to biting pressures for three to five days. Dr Ashish chopra (orthodontist) will advise patients and/or their parents what, if any, pain relievers to take. Overall, orthodontic discomfort is short-lived and easily managed. Once patients have become accustomed to their braces, they may even forget they have them on. I don’t want braces that show. What are my options? In some cases, braces may be bonded behind the teeth (lingual braces). Some of today’s wires are made of “space age” materials that exert a steady, gentle pressure on the teeth, so that the tooth-moving process may be faster and more comfortable for patients. Another option may be the use of a series of plastic tray aligners instead of traditional braces to correct some problems. My teeth have been crooked for many years – why should I have orthodontic treatment now? It’s never too late! Healthy teeth can be moved at any age. Orthodontic treatment can restore good function. And teeth that work better usually look better, too. A healthy, beautiful smile can improve self-esteem, no matter the age. Can I afford orthodontic treatment? Our treatment options ranges from variety of appliances, treatment can be economical and affordable once we discuss the requirement of the patient .Moreover at our clinic we provide convenient payment plans to all our patients. Do teeth with braces need special care? Yes. Patients with braces must be careful to avoid hard, sticky, chewy and crunchy foods, or hard objects, such as pens, pencils or fingernails. Keeping the teeth and braces clean requires more precision and time, and must be done every day if the teeth and gums are to be healthy during and after orthodontic treatment. Clean, healthy teeth move more quickly. How may I distinguish an orthodontist from a dentist? Orthodontist”-a specialist trained in the development, prevention and correction of irregularities of the teeth, bite and jaws and related facial abnormalities takes care of such cases. Orthodontist plans, place and regularly check braces as required.Teeth, and sometimes entire facial structures, are permanently changed by orthodontic treatment. It is important that the treatment be appropriate and properly completed. Orthodontic specialists have extensive and specialized training that enables them to provide their patients with professional, personalized treatments. It is best to check qualification of a dentist before you start your treatment, you should confirm that the person is a post graduate specialist orthodontist holding a masters degree in orthodontics.you can either check on website , sign boards, or by asking the doctor. Can my child play sports while wearing braces? Yes. But wearing a protective mouth guard is advised while riding a bike, skating, or playing any contact sports, whether organized sports or a neighborhood game. Dr Ashish can recommend a specific mouth guard if required. Malocclusion literally means bad bite. Most malocclusions are inherited, however, it is possible to acquire a bad bite from habits such as tongue thrusting and thumb sucking. The premature loss of baby teeth or the extraction of adult teeth can also cause the development of malocclusion. “Orthodontist”-a specialist trained in the development, prevention and correction of irregularities of the teeth, bite and jaws and related facial abnormalities takes care of such cases. Orthodontist plans, place and regularly check braces as required.Teeth, and sometimes entire facial structures, are permanently changed by orthodontic treatment. It is important that the treatment be appropriate and properly completed. Orthodontic specialists have extensive and specialized training that enables them to provide their patients with professional, personalized treatments. At our clinic Dr Ashish chopra (Orthodontist) renders orthodontic treatment. Orthodontic treatment can be done at nearly any age. An ideal time for placement of braces is between 10 and 14 years of age. Braces are not just for kids. More and more adults are also wearing braces to correct minor problems and to improve their smiles. Health, happiness and self-esteem are vitally important to adults. No patient is “too old” to wear braces! Many orthodontic problems are easier to correct if detected at an early age before jaw growth has slowed. Early treatment may mean that a patient can avoid surgery and more serious complications. It is recommended that every child first visit with an orthodontist should be by age 7 or earlier if a problem is detected by parents, the family dentist or the child’s physician. Early intervention and interceptive treatment can lessen the severity of a problem, and it frequently makes the completion of treatment at a later age less time consuming and less expensive. With the use of growth modification appliances facial jaws growth and tooth eruption can be modified to correct position. •	Correcting cross bite, tooth grinding, tooth interference and lower jaw displacement. Your orthodontist will know what appliance is best for your particular problem, but the patient often has a choice. Different types of brackets or braces are metal, Ceramic, Lingual braces and Self-ligating braces and . Ceramic braces are tooth colored so are far less noticeable. Wires and elastics along with braces are used to move the teeth to the desired position. It will vary for each patient and always depends on how much your jaw needs to change and how far your teeth must move. The more complicated your bite problem is, and the older you are, the longer the period of treatment, usually. Most patients can count on wearing full braces between 18 and 30 months, followed by the wearing of a retainer for at least a 6 months- 1 year to set and align tissues surrounding straightened teeth. Will I need to get my teeth extracted for braces? Most patients experience some discomfort the first week after their braces are put on and immediately after their braces are tightened .The interconnecting wires are tightened at each visit, resulting in mild pressure on the brackets or bands to shift teeth or jaws gradually into a desired position. Your teeth and jaws may feel slightly sore after each visit, but the discomfort is brief. All pain killers should be avoided however non-steroidal pain reliever like ibuprofen can be used to ease the discomfort in case of severe pain. Do I have to avoid any foods or personal habits? Yes. Any food that can bend wires or stick to the teeth. Some of those foods include: ice, hard candy, raw vegetables and all sticky foods (i.e. caramel ) Cut hard foods like carrots or apples into smaller pieces. No hard and crunchy snacks like Pizzas etc that can break braces, including popcorn, nuts and hard candy. Cut down on sweets, chips and popcorns. Sugary and starchy foods generate acids and plaque that can cause tooth decay and promote gum diseases.You can avoid most emergency appointments to repair broken or damaged braces by carefully following our instructions. Most patients in braces will be seen every 4 to 5 weeks. If there are specific situations that require more frequent monitoring, we will schedule appointments accordingly. How to do home care of my teeth with braces? With braces, oral hygiene maintainence is more important than before. Braces have tiny spaces where food particles and plaque get trapped. Brush carefully after every meal with toothpaste and a soft-bristled toothbrush. Patients should brush their teeth at least four times each day – after each meal and before going to bed. Rinse thoroughly and check your teeth in the mirror to make sure they’re clean. Insufficient cleaning while wearing braces can cause enamel staining around brackets or bands. After braces are removed, teeth can shift out of position if they are not stabilized. Retainers provide that stabilization and are designed to hold teeth in their corrected, ideal positions until the bones and gums adapt to the treatment changes. Wearing retainers exactly as instructed is the best insurance that the treatment improvements last for a life. Retainers are of two types removable and fixed lingual bonded retainer. Either one can be utilized as the patient and orthodontist decision. On the first appointment we will take the necessary records of teeth, photographs and X-rays to make a proper diagnosis. The doctor will then advice for any fillings , cleaning or any other procedure to be done before orthodontic treatment. Final treatment planning is discussed with patient. Discussion is done regarding any extraction or any other appliance such as expansion, mini implants , functional appliance , distalization to be used . The appliance is placed and regular monthly appointments are scheduled. At the last appointment appliance is removed and retainers are placed. About the appliance Traditional Braces are silver and are attached to the outside of the teeth. Traditional Ceramic Braces are clear and are attached to the outside of the teeth. 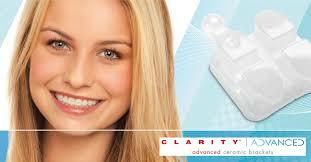 Clear Plastic Aligners are less visible than metal, but more than lingual. The patient must remove the appliance and clean whenever eating and drinking. This type appliance does have limitations. Lingual Braces are silver and attached behind the teeth and not visible at all to anyone except the patient and orthodontist! Why us for orthodontic treatment ? • Dr. Ashish has practicing from 2006 experience using all types of orthodontic appliances while staying up to date with the most current advances in the field. He is dedicated to finding the best form of treatment to suit your individual needs and desired results. • Dr. Ashish evaluates every case individually to determine the most efficient treatment plan to achieve optimum results for the patient. • Dr. Ashish treats every patient with the utmost respect always giving them the education and information necessary to make their decisions about treatment. Questions from patients are always important and welcome. • Our treatment plan discussion takes an educational rather than sales approach with our patients. • Although the majority of our patients are between the ages of 20 and 40, our current range is from 7 to 61.